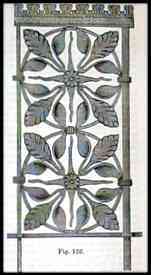 Having considered metal work in its more costly branches, we come to the consideration of hardware; and I am glad that we have reached that part of our subject which deals with inexpensive materials, for they are those which must be generally employed, while works formed of the precious metals can be used only by comparatively few persons. The object of art is the giving of pleasure. If as an artist I give pleasure, I do to an extent fulfil my mission; but I do so perfectly only when I give the greatest amount of the most refined pleasure by my art that it is possible for me to give. If by producing works which can be procured by many I give pleasure, it is well that I do so; but if the many fail to derive pleasure from my works, then I must address myself to the few, and be content with my lesser mission. Education appears to be necessary to the appreciation of all art; the artist then, is a man who appeals to the educated. If some persons, by their superior education, are enabled to appreciate art much more fully than those who are more ignorant, and can consequently derive much more pleasure from it than the less cultured person, it might then be desirable that the artist should address himself, through costly materials, to the few, for thereby he might be giving the gratest amount of pleasure. I always, however, like to produce works in cheap materials, for then I know that I form what is capable of giving pleasure to the poor man - if appreciative - who may possess it, as well as the rich. In hardware we have two classes of work produced which appear to have little in common - the one class being characterised by a preponderance of excellence, and the other by the dominance of what is coarse and inartistic. The first class of work is that which is produced by what are termed ecclesiastical metal workers; the second consists of what is generally known as Birmingham ware. It is an error to suppose that these so-called ecclesiastical - or mediaeval, as they are sometimes called - metal workers produce only ecclesiastical or mediaeval work. On the contrary, some of these men - and they are now many in number - devote themselves almost exclusively to domestic work, and most of them fabricate articles in all styles of art. If I wanted an artistic set of fire irons, I should go to one of the ecclesiatical warehouses, for there I have seen many sets that my reason commends and my judgement approves; but I never saw a set produced for the general market that I liked; and the most artistic fenders, grates, and gas-fittings, in almost any style, are to be got at these shops. I do not mean to convey the impression that all things made at these ecclesiastical warehouses are good, and that all things of Birmingham (or Sheffield) manufacture are bad, for I have seen indifferent works in these mediaeval shops, and I have seen excellent things from Birmingham - especially I might mention as good certain gaseliers produced by two Birmingham houses - but as a rule the works found in hardware produced by Birmingham or Sheffield are bad, in point of art. It will appear monotonous if I insist that the materials of which works of hardware are formed be used in the easiest manner in which they can be worked, and that every article be so formed as perfectly to answer the end of its formation. Yet I must do so. Let us look for a common set of fire irons, and we shall find that nine pokers out of ten have a handle terminating in a pointed knob. Now, as the object of this knob is that of enabling us to exercise force wherewith to break large pieces of coal, the folly of terminating this knob with a point is obvious. A poker is, essentially, an object of utility; it should therefore be useful. It is ridiculous to talk of a poker as an ornament; yet we find it fashionable now to have a bright poker as an ornament which is obtrusively displayed to the visitor, and a little black poker, which is carefully concealed from view, reserved for use. I cannot imagine what people will not do for show and fashion, but to the thinking mind such littleness as that which induces women to keep a poker as an ornament must be distressing; and until persons who desire to be regarded as educated learn to discriminate between an ornament and an article of utility little progress in art can be made. If a poker is simply a thing to be looked at, then it may be as inconvenient as you please, for if it has no purpose to ful;fil by its creation it cannot be unfitted to its purpose. The same remark will apply to shovel and tongs. If they are intended as works of utility, then their form must be carefully considered; but if they are to be mere ornaments I have nothing to say respecting them. Utility and beauty are not inseparable; but if an article of any kind is intended to answer any particular end, it should be fitted to answer the end proposed by its formation; but after it is created as a work of utility, care must be exercised in order that it be also a work of beauty. With due consideration, almost every work may be rendered both useful and beautiful, and it must ever be the aim of the intelligent ornamentist to render them so. Iron is capable of being wrought in various ways; it may be "cast" or "hammered" or cut or filed. "Casting" is the least artistic mode of treating iron; but if iron is to be cast, the patterns formed ahould be so fully adapted to this mode of formation that the method of working may be readily apparent. It is foolish to seek to make cast-iron appear as wrought-iron: cast-iron should appear as cast-iron, and wrought-iron as wrought-iron. Cast-iron is brittle, and must not be relied upon as of great strength; while wrought-iron is tough, and will bend under great pressure rather than break. Wrought-iron can be readily bent into scrolls, or the end of a rod of metal can be hammered flat and shaped into the form of a leaf, and parts can either be welded together or fastened by small collars, pins, or screws. 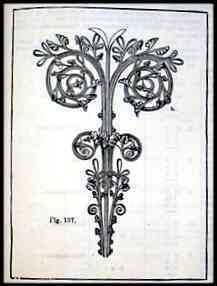 One or two illustrations of good wrought-iron by Skidmore, Benham, and Hart, we give in our engravings. 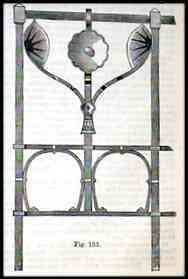 As an illustration of a simple railing, we figure one shown in the International Exhibition of 1862 (Fig. 133), which is in every respect excellent. Its strength is very great, yet it is quaint and beautiful. 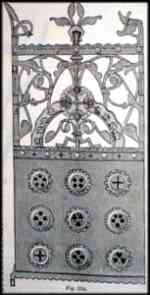 As it was shown it was coloured, and the colour was so applied as to increase its effect and beauty. If the student will carefully devote himself to the consideration of excellent works in metal, he will learn more than by much reading. Let him procure, if possible, the illustrated catalogues of the leading makers (and it will not be very difficult for him to obtain them), and study the sketches which he will there see, and he will certainly discover the principles of a true art, such as he must seek to apply in a manner concordant with his own original feelings. Of our illustrations, the example by Skidmore (fig. 137) furnishes us with an excellent mode of treatment. Iron bands are readily bent into volutes, or curves of various descriptions, and the parts so formed can be united by welding, screws, or bolts. Hardman's gate (Fig 134.) is in every respect excellent; it is quaint, vigorous, and illustrative of a true mode of working metal. The two foliated railings (Figs. 135,136) are also very meritorious. They are simple indesign, and their parts are well fastened together. I advise very strongly that the student carefully consider the illustrations which have accompanied this lesson. The same subject will be continued in the next chapter, in which further examples of ornamental iron work will be given from ancient and modern sources to which I am anxious to call the attention of the student.